I got the image back from the professional photographer so I thought I would post it here. I always have my work professionally digitized. That way in the future if I want to have prints, postcards, notecards and so forth I have a really good image to work from. I plan on selling giclee' prints on canvas of this one. I haven't decided what size yet but once I do I'll post it here. It will be a limited edition run of 150 prints. As I said I'm not sure of what size but I'm thinking I may have it done in the actual size of the original which is 12" X 20". As for the Zebras I have the contour drawing done and I started putting in the sky. I really don't have enough done to post yet but will hopefully have something soon. 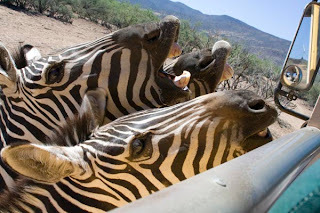 We went to a wildlife park near Sedona, AZ called "Out of Africa". They have this one area called the Serengeti safari where you drive thru in an open bus. 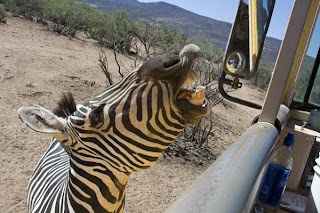 At one point we stopped and some Zebras came up to the bus to get their treats. It struck me funny because it seemed as if they were laughing. I got several photos of them but not one of them was what I would call a great picture. 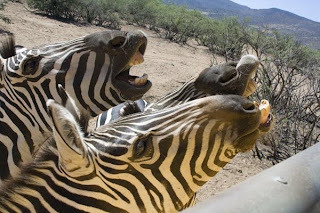 As you can see here two of the Zebras look pretty good but the one in the back isn't in the best position. Also the one in the front really isn't laughing, his mouth is closed. 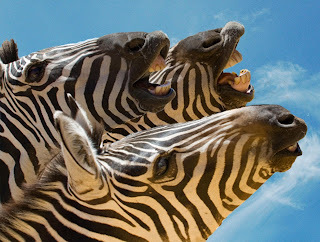 On this photo the Zebra in the front has his mouth parcially opened. I liked that better than the front Zebra in photo #1. Here is a pretty good photo but the Zebra is all by himself and I liked the idea of having three of them together. So..... started with photo number one in Photoshop. I erased everything except the two front Zebras. Then I took just the mouth of the front Zebra in Photo number two and placed it over the mouth of the front zebra (now he has his mouth open). Then I erased everything except the Zebra in Photo number three and added what was left in the back of this version of the Zebras. Then I found a sky picture I and added that in the background. And.... Voila!!! I now have more of what I was looking for. I will use this reference for my drawing. As I mentioned in my last post, I will be using the Art Board with the Hot Press Arches watercolor paper mounted on it. I will start drawing my contour drawing on the Art board tomorrow. I'll keep you posted on how it goes. Oh.... and the title of this piece will be "LOL". Well I finally finished this one. I'll be taking it in to have it professionally scanned so I will re post it as soon as I get that scan back. This really isn't a great digital file of it. It definitely looks better in person. I should be starting another piece in the next day or so. I plan on drawing some Zebras. I will post the reference photos that I will be using and show you how I combine several references to get the composition I want. It should be an interesting article. So be sure to check back. I got a sample from Art Boards. They have a board with Arches watercolor paper mounted on it. That is the support I will be using on the zebras. I have never used this before so I'll keep you posted and let you know what I think of the product. I Will be attending a Pastel Workshop! For a very long time I have wanted to learn how to do Pastels. 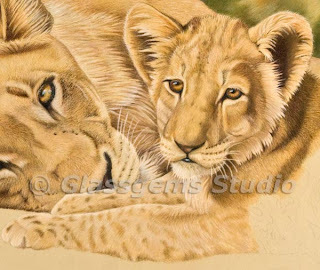 I was so excited when I saw that Lesley Harrison, not only a wonderful Pastel artist but, her subject of choice is Animals/Wildlife, is doing a workshop in my area. I just can't wait to attend this workshop. The workshop is being held in Placerville, CA in July. 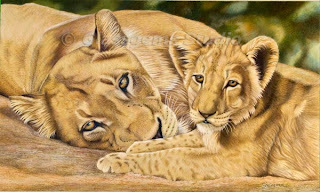 Here is the Workshop description: Lesley Harrison is well known for her beautiful and sensitive paintings of horses and other animals. This workshop is specifically for those who wish to explore and learn how to use soft pastels as a full painting medium. Three full days of class time with Lesley is an opportunity you don't want to miss. Lesley will begin with a demonstration and then there will be plenty of time for people to paint and have individual attention. Here is Lesley's webpage: http://www.harrison-keller.com/. She is an excellent artist, I just can't wait!! I'll be sure to keep you posted about the workshop when I attend. This week has been a really crazy week for me so I haven't had a chance to work much on this. 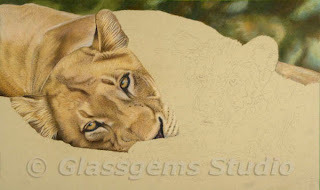 I did get a chance to put the cubs legs in so I thought I would go a head and post an update. I hope to be able to spend more time on them this week. Things are finally starting to calm down a bit. For those of you who love wildlife art, have to go check out this great online art magazine. Wildlife Art Journal is available to you every day, with a constant flow of new and updated stories and it costs you far less than most other printed art magazines. Best of all, you'll have unlimited access to read the stories you like, or artist profiles you may have missed, any time, anywhere, simply by logging on. For only $1 U.S. per month, you get all of the benefits of a premium membership: Full access to stories about painters, sculptors, photographers and nature filmmakers, regular updates on auctions, museum exhibitions, gallery openings, special events, guest essays, their exciting blog RarAvis, wildlife art news from around the globe, and much more. 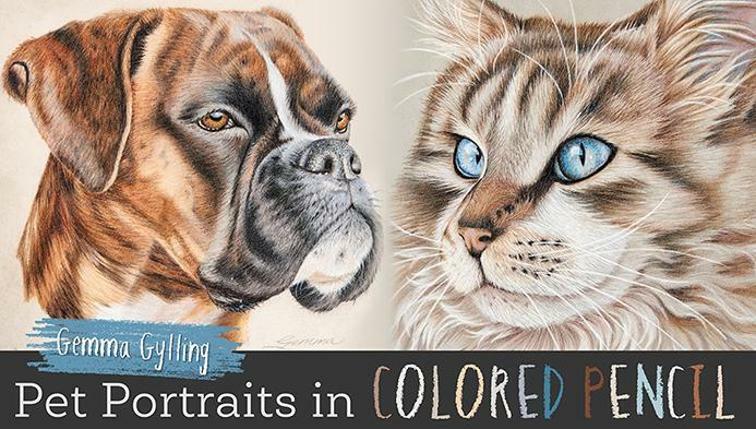 Ann Kullberg has a great new book titled "Colored Pencil Secrets for Success", the publisher is Northlight Books. My artwork is included in this book, I feel so honored to be one of the artists chosen for the book. It is now available at Amazon! If you are interested in buying the book you can use the link I provided below. Keep Scribbling!! 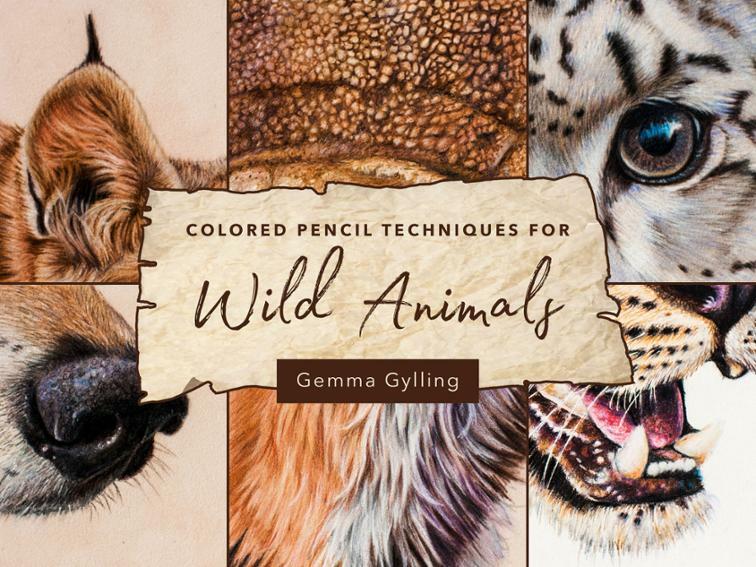 If you are interested in finding out how to buy more of my favorite Colored Pencil books scroll down to the bottom of this page. 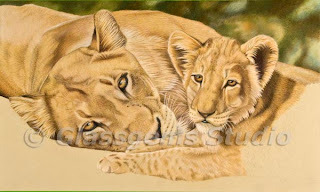 I wasn't able to do to much on this but I have been able to proceed on the cub some. I have his little face completely done and I'm now starting to work on his body. It has been such a joy to draw these two. 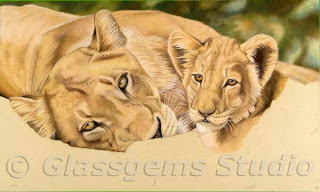 There is a great little story behind them..... when we were in Africa we were following a den of lions. 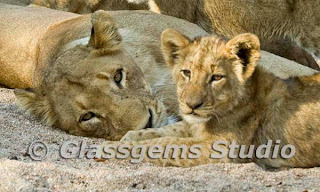 There were 5 females and 10-11 cubs. We followed them down into a sandy dry riverbed. It was cooler down there because it was down in a ravine. We sat there in our Landrover for a while and I took several pictures of the entire den. When we decided to leave the Landrover would not go into 4 wheel drive. We got stuck..... big time! We had to just sit there until the lions decided to leave. Once they left we were able to get out of the vehicle to get it unstuck. Needless to say I have a bunch of pictures of these lions. I'm sure I will be drawing them for a long long time. Enjoy! 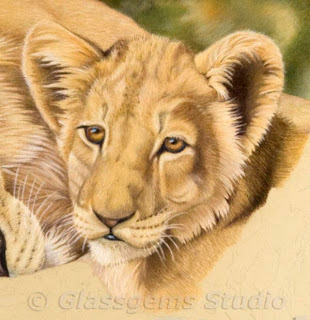 I have the background in and I'm starting to create the Momma lion. When I draw I first draw in the contour drawing. From there I start creating my subject. I tend to finish each little section as I go. 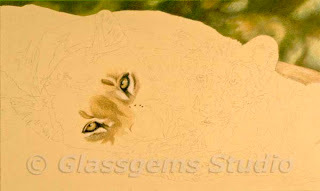 Colored Pencil is a very slow medium, I tend to not to get bored with the piece when I work in this fashion. 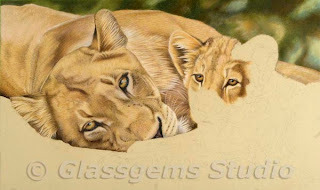 You can see now how the momma lion is coming along. With the following picture you can see the contour drawing a bit better than in the last photo of the piece. Now I'm starting to work on the baby. I think this is coming along fairly well. I will probably go back and touch up a few things but so far most of what I have done will stay as you see it here.